When can I come back to College for an event? Each year there is a very popular London Reception in May and we have begun to hold similar receptions in other parts of the country, primarily the North. In the College we hold a dinner in the autumn (to which all are invited), the Boar’s Head Gaudy (to which you are invited about 25 and then 35 years after you matriculate), and the Needle and Thread Gaudy (to which you are invited about 15 and then 45 years after you matriculate). We hold a Gaudy Lunch in October on the fiftieth anniversary of your matriculation. You will also be invited to a subject-based reunion every five years either in January (lunch) or at Easter (dinner) and a Garden Party at the end of Trinity Term in years when there is no Commemoration Ball. We also hold regular events overseas (particularly in North America), and we have recently expanded our list of events to include a ‘Ten Years Later’ lunch (one decade after you matriculate). There are a number of ways in which Old Members help the College. An increasing number of people are making a regular gift to Queen’s. Please refer to the fund-raising pages of our website, or give us a call, to find out about the reasons why we need your support and for practical information on how you can give. In addition, a significant number of Old Members have promised to leave the College a gift in their will. The College is a registered charity (number 1142553) which means that such gifts are deducted from the value of your estate prior to its assessment for inheritance tax. Again, for more information please visit the fund-raising section of our website or contact the Old Members’ Office. Old Members also support the College by giving their time and advice on a whole range of matters. If you would like to be involved then please email us. Old Members come back to College regularly to support our events and give advice to current students about their career paths. Where can I get an University of Oxford Alumni Card? - Visit the page and login. - If you do not have a University Alumni account, you will need to register here, and you will need your alumni number, which is on most communications the University send to you. - If you do not have your alumni number, you can request the number here. If you have any further questions, please contact the University Alumni Office via email or telephone: +44 (0)1865 611610. How do I take my degree? Degree days for members of the College are held on six days during each year, usually on one occasion in Michaelmas Term, and five across Trinity Term and the Long Vacation. Degrees to be taken ‘in absentia’ can be arranged at any University ceremony. Please contact the College Office for a list of dates and to request a booking form. Dates, ceremony information, and booking forms can also be found on the College website. First time or replacement degree certificates must be ordered from the University; please visit the University website for details of how to go about this and for a comprehensive guide to Matriculation and Graduation. The College can provide proof that you attended Queen’s and an official document confirming the degree you read and the class in which you were placed. Please email us. During term time, there are two guestrooms available - Back Quad 3/2 (a ground floor twin bed room with full ensuite facilities) and Drawda Hall 6a (an upstairs small single bed room with an external shower and toilet close by). All guestroom reservations must be requested via an email (either to the Lodge or Old Members' Office) which gives clear information regarding the requester, the required dates and the name and number of guests – until we receive the email and reply to it the reservation is only regarded as provisional. The charge for rooms is advised by the Bursary and is inclusive of breakfast. The maximum length of stay in three nights at one time. Old Members may only make reservations for themselves. 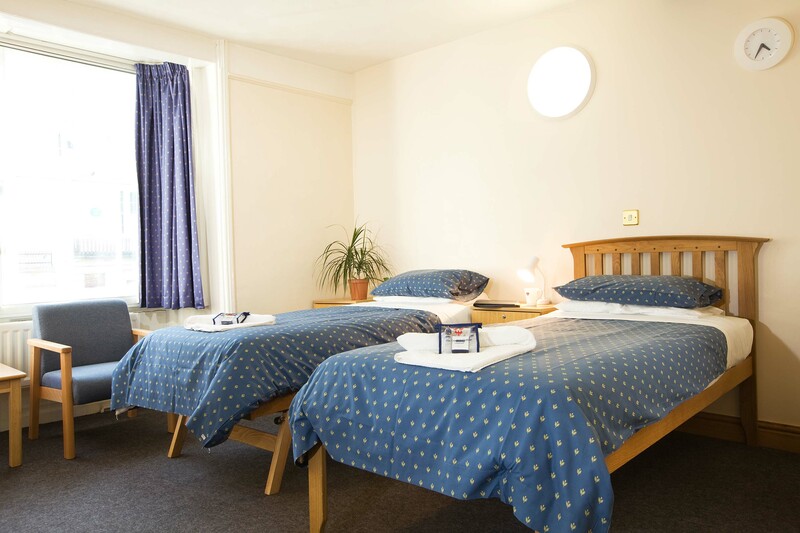 During the vacations the College offers a variety of other rooms on a bed-and-breakfast basis and, subject to availability, they can be booked via the Conference Office – conferences@queens.ox.ac.uk. Old Members are entitled to a substantial discount on these rates, using a specific promotional code when booking (Conference Office staff will let you know what this is when you contact them). Alternatively, universityrooms may have accommodation available at other colleges that offer a discount to Queen’s alumni.